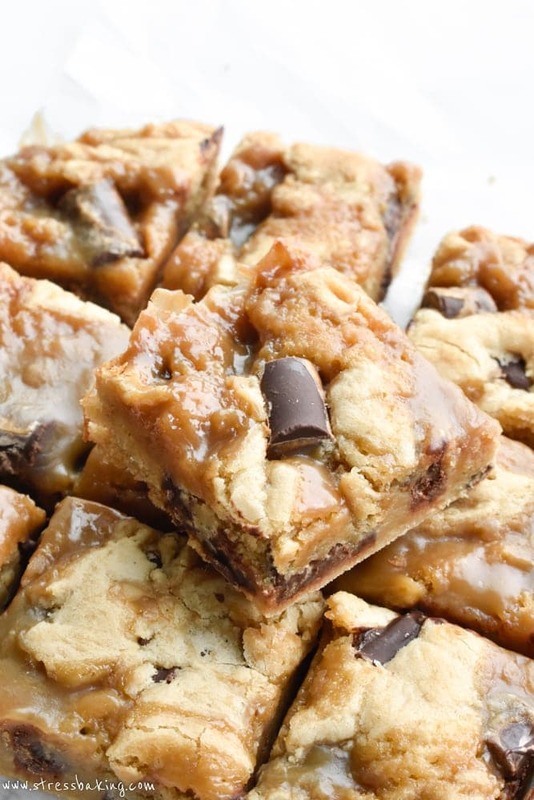 Soft and chewy blondie bars loaded with dark chocolate chunks and ribbons of gooey, rich, homemade salted butterscotch. If you’re reading this the date it posted (April 2nd), that means I am currently in Las Vegas trying to win back the money we just put down upon closing on our new home. Okay, fine – that’s not actually why we’re in Vegas, but that would be pretty freaking great, wouldn’t it? We’re actually out there to visit family, with a side of people watching. … and a little gambling. I mean, it’s Vegas. I can’t nottry at least one hand. Aaaaaaanyway. We closed on the house last Wednesday, and then left the next day for Vegas. This trip’s been planned for a long time, and the timing of the house closing was not ideal. We’d originally planned to close the day we got backfrom Vegas, but it turns out that someone missed a little bit of math during the mortgage-planning and our interest rate would have no longer been locked by closing day. Meaning, the interest rate would have jumped way up and that’s an incredibly expensive (and long term!) price to pay for not wanting to be slightly rushed by a week. So, the day before vacation it was. Due to the timing, I figured we could call any Vegas winnings us winning some of our house expenses back, and it’ll help lessen the sting of that big ole check we just had to throw down. House buying is no joke, my friends. 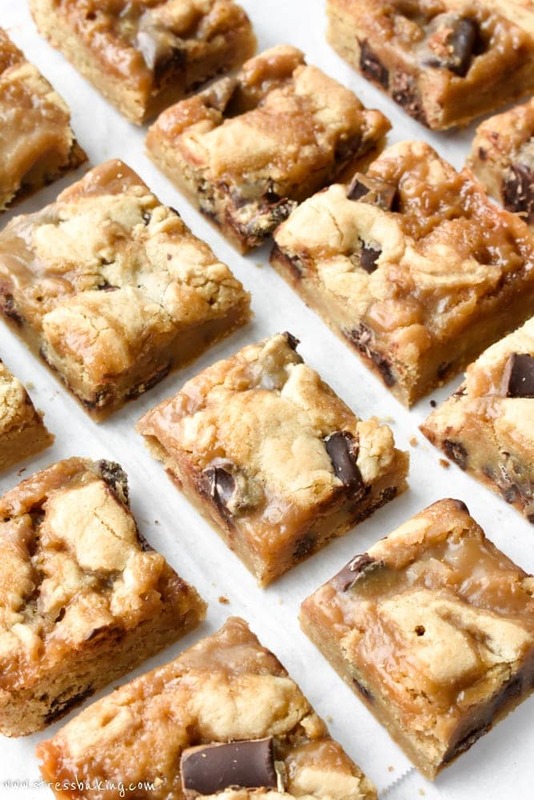 Now – let’s talk chocolate chunk butterscotch blondies. I wanted to make a pan of something other than fudgy chocolate brownies (which is the boyfriend’s usual treat of choice), and realized I hadn’t tried my hand at butterscotch bars yet. The boyfriend is a bigfan of toffee and butterscotch, so it was the next logical progression in my baking adventures. 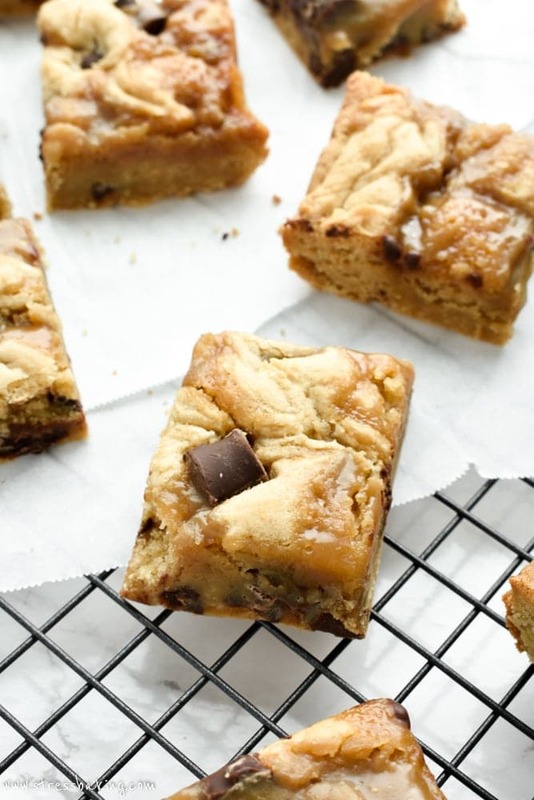 These bars are soft and chewy, which is basically the only way I like a good blondie bar. They’re filled with chunks of dark chocolate, because I just can’t help myself and have to add chocolate to just about everything. These are also lousy with ribbons of rich, gooey, homemade salted butterscotch sauce. 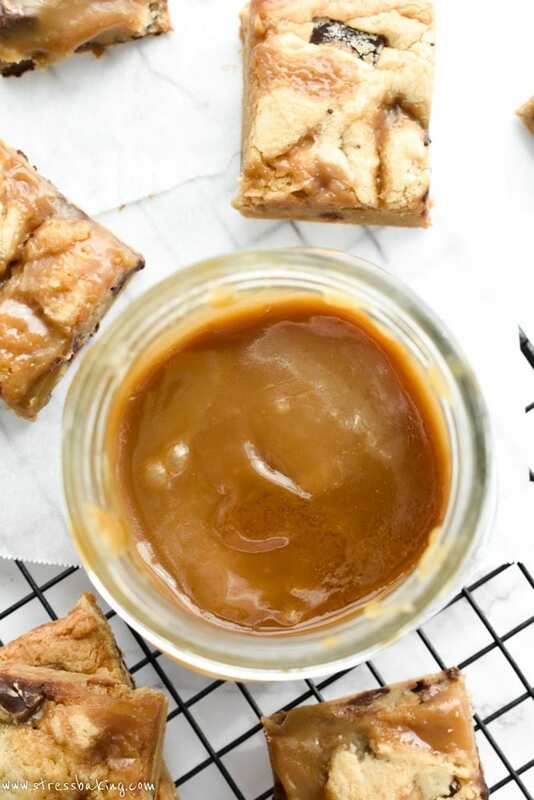 OMG WE NEED TO TALK ABOUT THE BUTTERSCOTCH SAUCE. It’s thick, sweet buttery perfection with just enough salt to complement the sauce’s sugary nature. Even better? It’s easy. You don’t need to be intimidated by it, and I’m not asking you to use a candy thermometer to make it happen. It’s totally doable, and I believe in you. It’s also going to make enough for you to have leftovers, and this is the kind of leftovers I can totally get on board with. Use it for another batch of these bars, or to drizzle on some ice cream. I highly recommend it as a topping for my no churn homemade Americone Dream ice cream or this chocolate ice cream. Or… really anything at all. Pour it directly in your mouth if you want. There’s not supposed to be water there… at all. Good lord, am I glad that’s over. So, yeah. These are great and you should make them. I could babble on about them more, but quite frankly I need to go back for Vegas and I don’t have anything else interesting to say. Don’t you just love (read: kinda hate) my honesty? 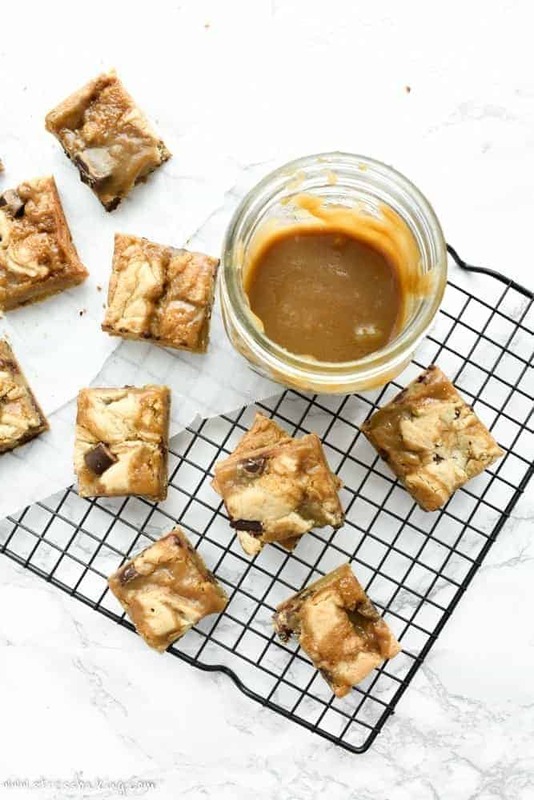 It’s not that I don’t care about what goes into the post – it’s that I want you to have this recipe available to you ASAP and my lack of being interesting in a social sense shouldn’t prevent you from the joy that is a pan of these butterscotch blondies. So you see? It’s because I care that I’m going to shut up and let you get to bakin’. Enjoy a few more pictures, if you so desire. Can’t get enough butterscotch? ME EITHER. I highly recommend this butterscotch pudding from Bowl of Delicious – it’s not just homemade from scratch, it has a built in arm workout ? How about butterscotch with your breakfast? This banana bread from Six Sister’s Stuff has butterscotch added to it, and banana bread is breakfast, sooooooo totally acceptable for 7AM. 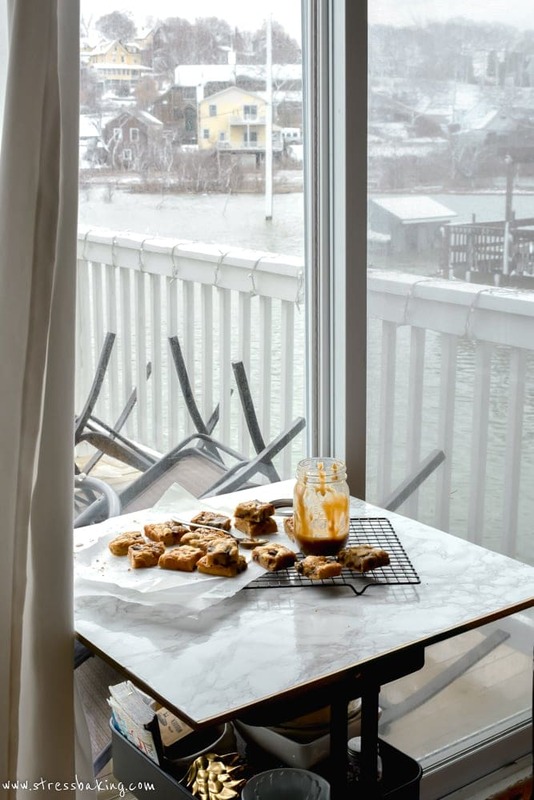 You can’t go wrong with butterscotch cookies. You just can’t. This recipe from The Salty Marshmallow is proof. Orrrrrr this no churn salted butterscotch ice cream from Plating Pixels. I don’t care that it’s 12° outside, I want this NOW. 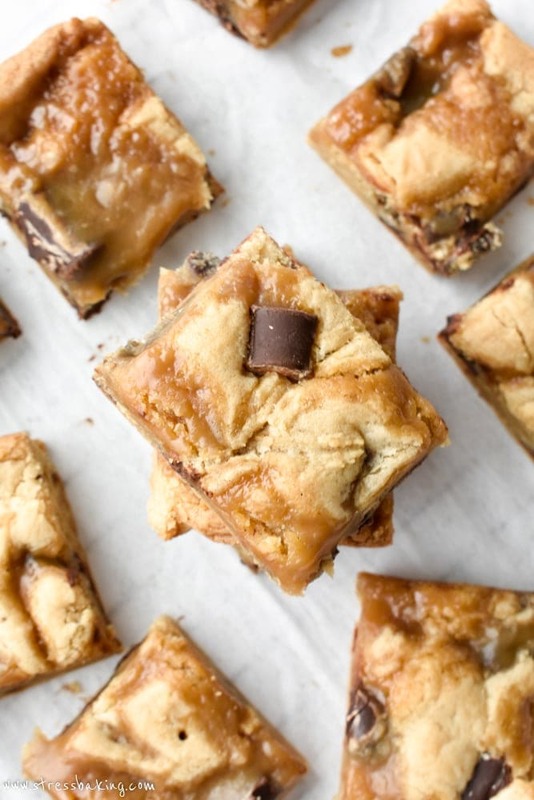 Soft and chewy blondie bars loaded with dark chocolate chunks and ribbons of gooey, rich, salted homemade butterscotch. Melt the butter in a medium heavy-bottomed saucepan (not non-stick) over medium heat. Add heavy cream, brown sugar and salt and stir constantly over medium heat until combined. Bring to a boil and let boil for 4 minutes. Remove from heat and stir in vanilla extract until combined. Transfer to a heat-proof container to cool completely at room temperature. 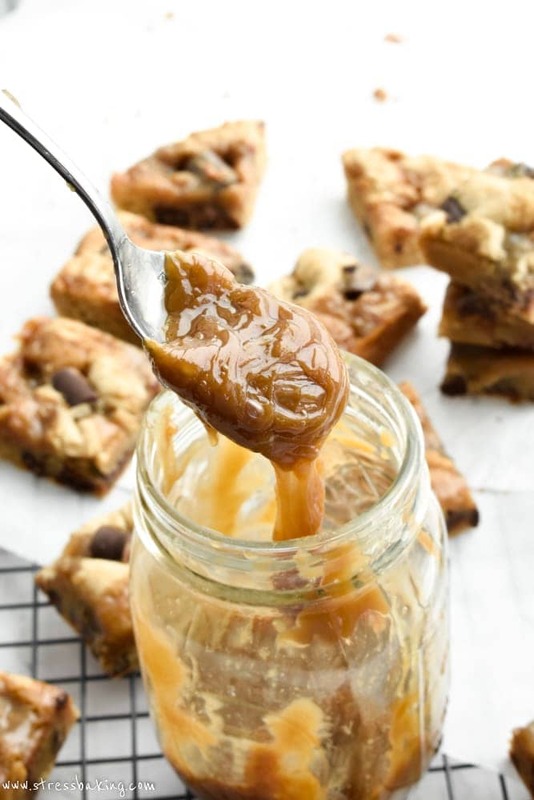 Once the container is no longer hot to the touch, set aside 1/4 cup (you’ll be using this for the blondies), cover the rest and store in the fridge. Use it as a topping for ice cream later! Preheat oven to 350°F. Line an 8×8 inch baking dish with parchment paper and set aside. In a medium bowl, whisk to combine flour, baking powder and salt. Set aside. In the bowl of a stand mixer, combine melted butter and brown sugar and beat on medium speed until combined. Add dry ingredients to the bowl of wet ingredients and mix on low speed until completely combined. As the batter thickens, you may need to turn it up to a higher speed. Add chocolate chunks (save a handful for topping) and stir until just combined. In your prepared baking dish, spread batter in an even layer. Drizzle your prepared butterscotch sauce over the top of the batter and gently swirl with a knife (see notes for more details). Press your reserved chocolate chunks into the top and top with flake salt (if desired). Bake for 20 minutes, or until a toothpick inserted into the center (try to aim for a non-butterscotch sauce spot) comes out mostly clean. Let cool in pan for 10 minutes, then left them out of the pan with the parchment paper and transfer to a wire rack to cool completely. Cut into 12-16 bars, serve and enjoy! Drizzle sauce over the batter in 4 evenly spaced parallel lines that run the length of the pan. Turn your pan 90°. Start at the top of one of the rows and with the end of a butter knife, drag it across the lines of sauce, and repeat 4 more times down the length of the pan. This is going to be my next baking project for sure! I would be doing shots of that butterscotch sauce too or drizzling it over my morning bowl of fruit! Wow these look to die for, I’m so excited to make these. It’s supposed to rain all weekend so I’m doing some baking (any excuse). I simply adore these brownies! 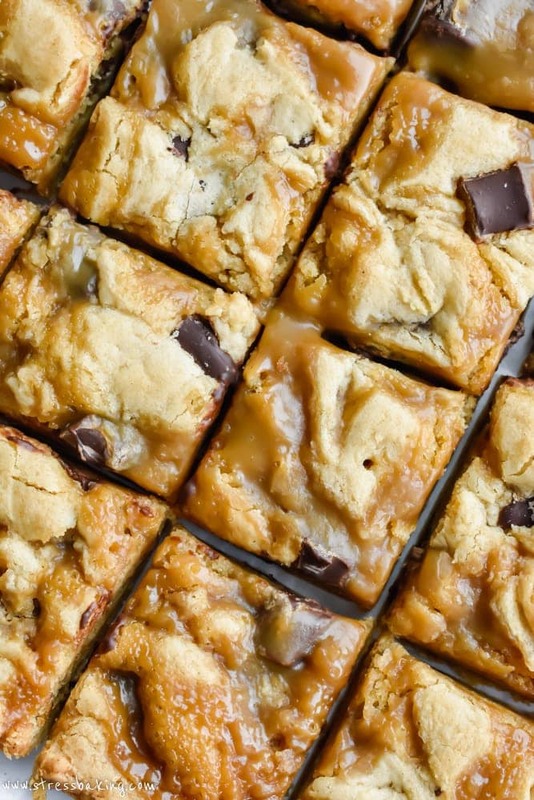 All the ingredients make these butterscotch blondies perfect. And the butterscotch sauce?? Omg, perfect. I am going to make these this weekend. And yes, buying a house is no joke. It’s stressful and expensive. But the worst is over! Enjoy your new home. These look SO good! I can’t even figure out which part looks the most irresistible, but I think that’s because it’s the bars as a whole that I could just devour. YUM! I love anything butterscotch. 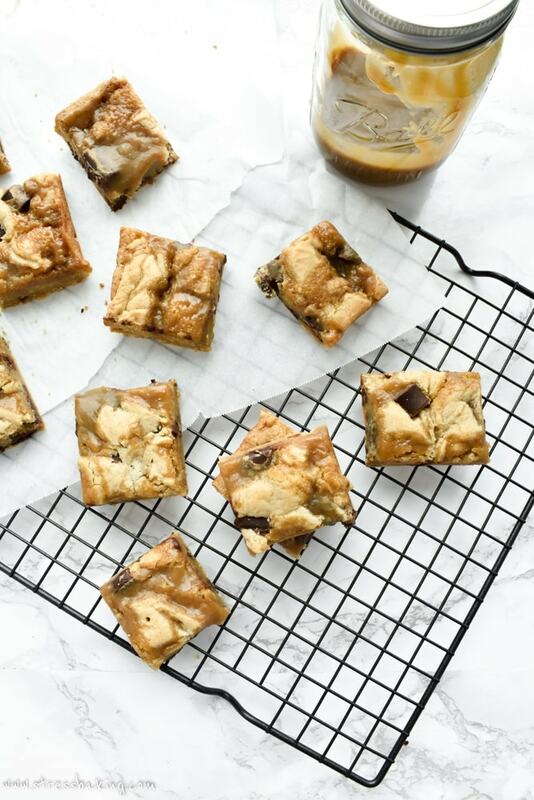 I love brownies blondies to make as well as to indulge. These look so perfect. Can’t wait to try soon. 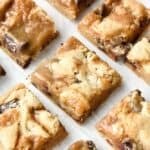 I love ordering blondies, but I’ve never actually made them myself! I will definitely have to remedy that with this recipe. 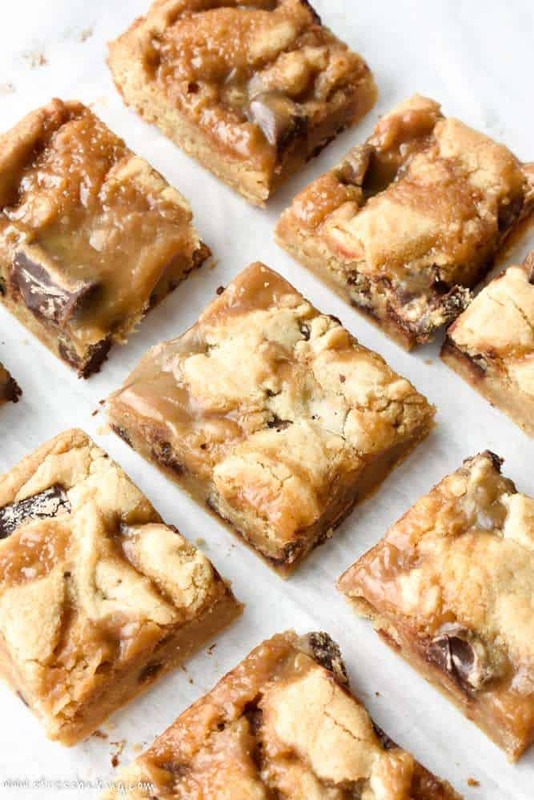 I haven’t had too many different blondies, but these ones are definitely gonna need to go on my to try list. They look so deliciously decadent, and that butterscotch/chocolate combo is serrrrriously fantastic! 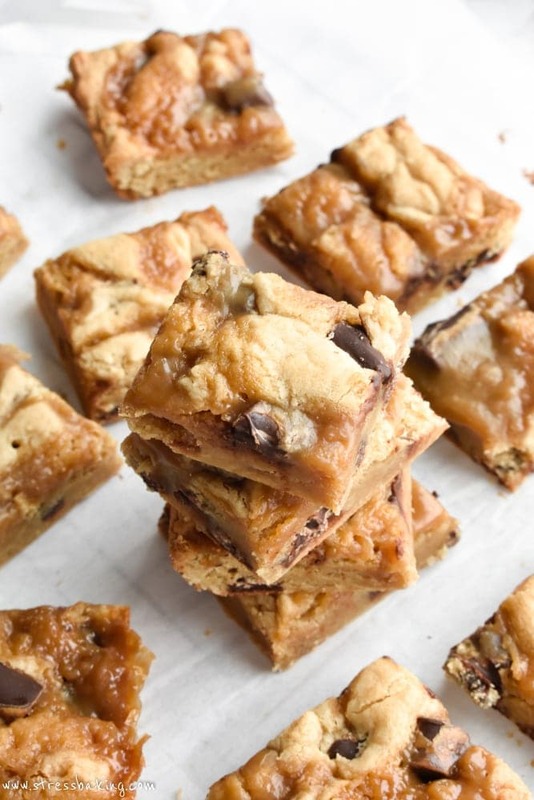 These blondies sound AMAZING! 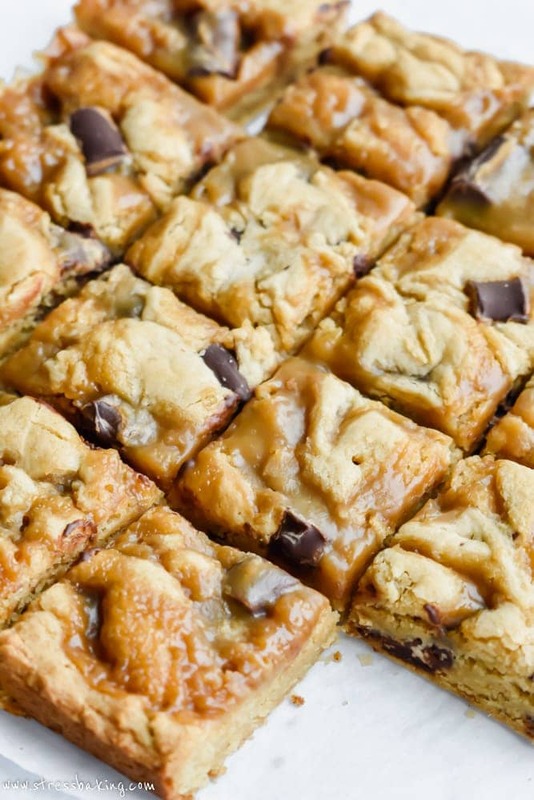 It’s been awhile since I’ve made blondies, but loving the chocolate chunk butterscotch flavor that these have. Yummy!